Keeping with my (self-imposed) knit fix challenge, I decided to whip up a new project over the weekend. 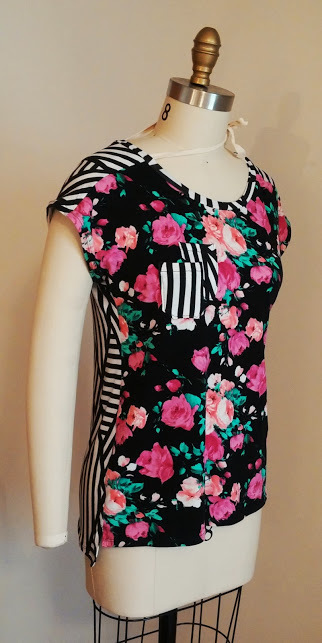 Using the black crossed lines jersey rayon spandex knit from my bag and Seamwork Magazine’s Mesa, I made a new, (adorable) dress! This is a simple shift design with a scooped neckline, side slits, and short, almost elbow length sleeves, that comes together in about an hour. Since the sewing on this one is pretty straightforward, I’ll skip to the fit… which is once again, spot on. It’s also a flattering shape so it should work with all body types (this pattern runs from XS-3XL). I was also surprised that I liked the neckline on this one – normally scoop necks feel as if they’re constantly falling off my shoulders and constantly needs adjusting, but so far, this one has worked well. The only thing I’m on the fence about is the sleeve length – it’s a bit of a strange length for me, although it definitely ‘dresses up’ the overall feel of the finished dress. All in all, this is another winner from Seamwork Magazine… I think once I’m done sewing up my knit fixes, I should finally get to work on the Adelaide – that one has been calling my name since I first saw it! This entry was posted in Knit Fix, Uncategorized on June 28, 2015 by stacy. 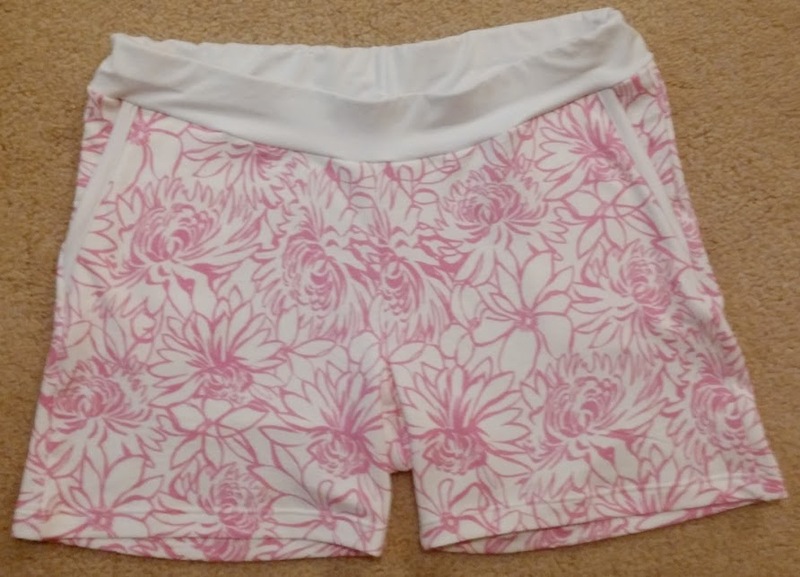 Last week I mentioned that my mom wanted\needed some new pair of comfy shorts…. so I made another pair of Peek-a-Boo Pattern’s Summer Lovin’! For this pair, I wound up using a remnant from the Anima Pants that I had sewn earlier this year and a white jersey for the pocket and the waistband. While I don’t have an ‘action shot’, the fit is spot on (this time I made a medium) and my mom has worn these several times since I’ve given them to her. Guess I need to make a trip to the fabric store for more notions so I can make her another pair! This entry was posted in Uncategorized on June 26, 2015 by stacy. Summer time often makes us rush out the door in a hurry. That’s when this Grab-N-Go pouch comes in handy. Perfect size for all your necessities without needing to carry a bulky purse! I don’t need to elaborate this one, the title says it all: The Ultimate Pool Bag. Showcase fabulous fabrics in your next bag when you fussy cut a Cat-Eye into cute little pouch. Belt Bags\Fanny Packs are hip again! This is probably the cutest one (yet a bit small) that I’ve seen. This is no ordinary make up roll. This one has a secret pocket, too. It’s a blanket. It’s a tote. It’s…. both! Perfect for yoga pants or athletic shorts, this tutorial will teach you how to add a pocket to your next knit waistband. Give up pants and wear more skirts this summer! I couldn’t be easier than this Summer Skirt tutorial. Looking for something a bit dressier? Then try the Veronika. Customize you next hoodie with the Cookie Hoodie Blouson add on. Accessorize you wardrobe with matching (or not) fabric cuffs. Make a sweet little girl’s dress with this Granny Chic tutorial. Need another scrapbusting project? This adorable patchwork fabric basket would make a great housewarming gift or birthday present when stuffed with goodies (or even by itself). This cute sewing machine stuffy makes the perfect pincushion or a great ‘voodoo doll’ for when your machine is acting up (you may need to translate the site for instructions). I never thought of trying my hand at making socks, but this tutorial makes it look easy. This entry was posted in Uncategorized on June 25, 2015 by stacy. After finishing up my Astoria, I was left with a nice little chunk of sweater knit to use for something else. The material reminded me of the casual sweater style tops that I see in PacSun\Hollister so I decided to use what was left to recreate that look. 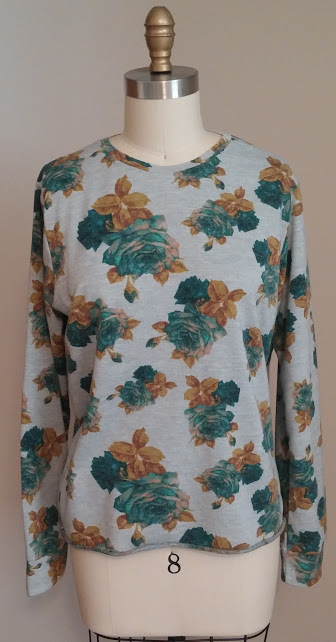 I started off with Jalie 3355 (a pattern that I had purchased last year, but never used because finding sweatshirt material with any amount of stretch is darn near impossible!) and eeked out just enough material for all the pieces… However, upon sewing, I discovered that while the fabric has enough stretch for the body, it’s just not stretchy enough for the neckline\sleeves\hem band. Consequently, I had to re-cut the neckline and cuffs slightly larger (thank goodness for large remnant chunks), but didn’t have enough for the hem band. Fortunately, the sweatshirt (or maybe this would be better called a sweater) rolls to the right side to create a fun, casual look. The end result is a cute (but not nearly as glamorous looking), casual top that is definitely going to be cozy to wear this fall (I’m thinking of pairing it up with a pair of denim shorts). I can’t wait to wear it! 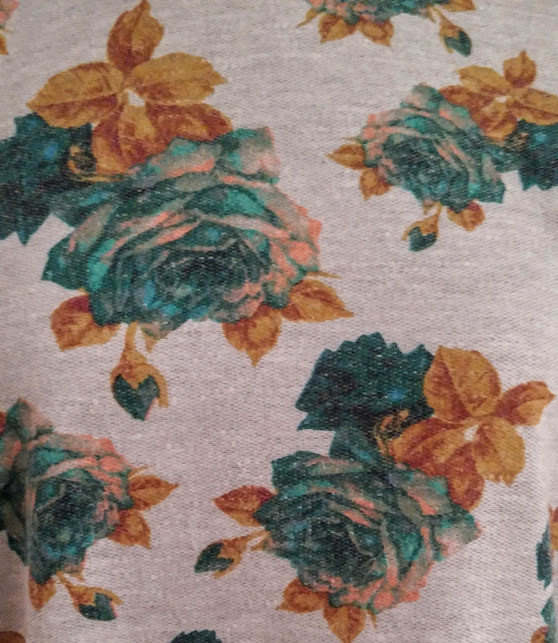 This entry was posted in Knit Fix, Uncategorized on June 24, 2015 by stacy. Before I even received my Girl Charlee Knitfix, I decided that if I received a red stripe (and especially the blue polka dot to go with it), that I would make the top similar to the one on the right. 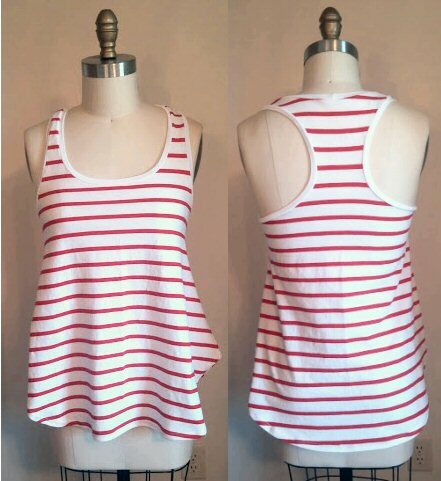 Looking at my patterns, I didn’t have anything quite like this style (the back is a racerback style that is ‘tied off’ with a matching polka dot bow) and since I didn’t want to morph two patterns together to get the look I wanted, I decided to hunt for something that was already drafted – that’s when I stumbled across the Free Spirit Tank. Not only did it have the tunic length and racerback, but it also had directions for a bow in the back too! It seemed perfect… until I did a test fit. For starters, the bust on the Free Spirit tank is way too tight (at first I thought that the material just didn’t have enough stretch, but after double checking it, it’s around 40% so it has to be the pattern). Pair this up with the fact that it has a lot of extra material in the midrift and you have a recipe for wonkeyness … it made a weird, large ‘pleat’ right under my bust that looked terrible. Putting it on the dressform didn’t create the same pleat, but there is definitely more material going on in the front (and not the back) that makes it look too maternity looking for my taste. While checking out the top on my dressform, Taylor walked by and saw this tank, thought it was adorable, and decided to snag it. When I told her about my plans to add the pocket and bow, she said “Why would you want to ruin it?”. As a side note, the tank is also snug in the bust on Taylor, but much less so so it hangs much nicer on her. 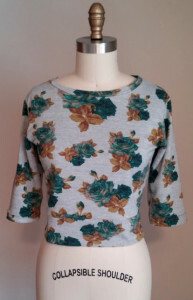 So it looks as if the inspiration top, while cute, just isn’t going to happen. The Free Spirit Tank isn’t for me and I’m pretty sure that the fit is a bit off too. This entry was posted in Knit Fix, Uncategorized on June 23, 2015 by stacy. 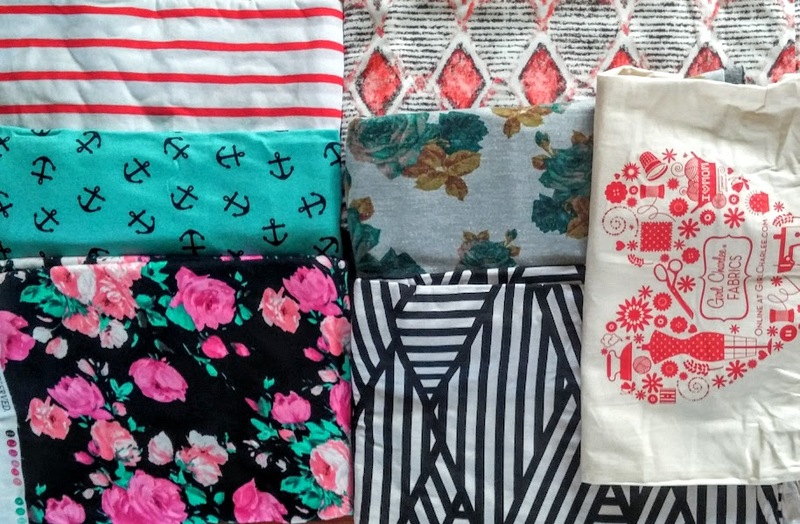 This weekend I was determined to start sewing with some of the fabrics from my Knit Fix bag. While I liked a lot of the material I received, the one that really stumped me as to what I wanted to do with it was the teal mustard floral on gray hacci sweater knit (that’s a mouthful, isn’t it?). It seems as if every month everyone gets on hacci fabric – most of which get turned into cardigans…. so I was very determined to do something other than a jacket with this one. After flipping though my patterns, I stumbled across Seamwork Magazine’s Astoria – a pattern that I hadn’t even given a second thought to because I thought I would never wear a cropped sweater. However, between the vintage feel of this fabric and the 50’s vibe of the pattern (I sort of envision this as a Jane Mansfield type sweater), I think that this would make the perfect match…..
And I was right! Actually, this turned out way cuter that what I had even envisioned. Unfortunately, I was so excited to sew this up, that I neglected to do the most important part…. do some preliminary measuring to see how this would fit me. You see, even though I am short, I am very long waisted. So while the sweater fits the model and my dressform right at the waist (or slightly above it), it falls about 2 1/2″ above my waistline on me. I’m not sure if a high waisted skirt or pants would solve the shortness issue, either. Fortunately, I have a teenage daughter who this would look fantastic on! The fit for Taylor is still short (longer than what it falls on me, maybe only an 1″ or so too short), but she can definitely get away with showing a bit of belly before I can! Plus she really liked the finished top. In the end, I think this was a win\win with the fabric and pattern…. However, if I sew the Astoria up again, I’m definitely adding some length! This entry was posted in Knit Fix, Uncategorized on June 22, 2015 by stacy. Overall, I love what I got in this bag! I’m not sure what to do with the diamond fabric although I did see someone post on social media a ready-to-wear dress that was made from this very material and I am trying to brainstorm what to do with the gray floral hacci other than the expected cardigan. While I mull it over, I think I’ll tackle the red stripe material – I’m thinking it will make the perfect 4th of July wear! But wait.. there’s more! 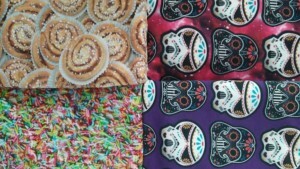 Four other fabrics that I ordered finally came in this week too! 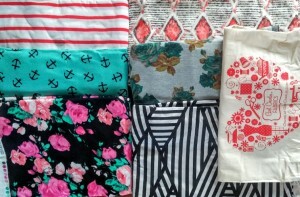 I’ve been waiting for my Happi Fabrics digital prints to arrive for ages and am excited to put them to good use. The texture of the material is a bit different than anything else I own, so I may have to think about how I’m using them in garments. 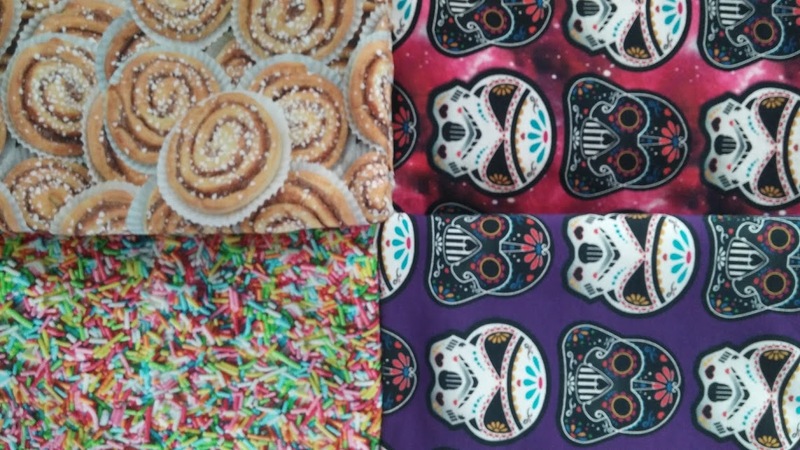 I also ordered a few yards of the Sugar Skull Star Wars print ….. yes, I ordered some (not in yet) in a different colorway, but had a sudden panic that what I did buy was a woven…. so I bought different material in a stretch just in case. Something tells me that I’ll be making a lot of Star Wars gear very soon! This entry was posted in Knit Fix, Uncategorized on June 19, 2015 by stacy. I have (lots of) new fabric arriving which means I’m on the lookout for new ways to stitch them up. Here’s a few free shirt patterns from Deer & Doe, It’s Always Autumn, and Peppermint (the Jersey Girl). Looking for a t-shirt for Dad (it is almost Father’s Day)? 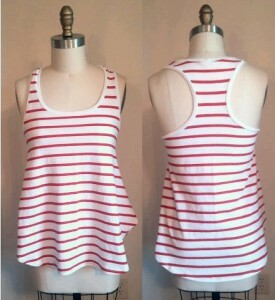 Try this one from Melly Sews\Blank Slate. The cutest bag of the summer goes to this ADORABLE pineapple backpack! Anyone know where to get that awesome yellow fabric? I may need to make one! Go to the beach without taking the beach home with you! Stitch up this beach toy mesh bag and let all the extra sand drizzle out on your way to the car. Canada Day is almost here so why not stitch up a fun maple leaf mug rug to celebrate? 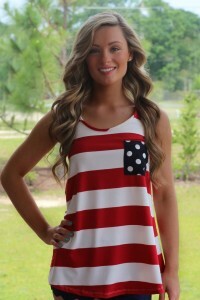 A tank top for girls (sizes 3-8) that you won’t have to worry about staying on their shoulders. Need a last minute gift for dad? Sew him up a custom pillow (templates are provided, too)! Admittedly, I had a bit of trouble translating this site, but this cute bag\caddy project looks so cute I couldn’t help but pass it along! I keep seeing cute fabric headbands all over social media lately… so now I want to make one! Here’s a quick and easy version that we can all make! No more cold hands when you’re drinking from jelly jars when you stitch up this mason jar cozy! Looking for a personalized wrap that fits something smaller? Try my can custom can wrap tutorial instead. Beat the heat with a cooling neck wrap (I want to try this just so I have an excuse to use those absorbing crystals). Learn the ‘quilt as you go’ method and make a great 4th of July pillow, too! This entry was posted in Uncategorized on June 18, 2015 by stacy. 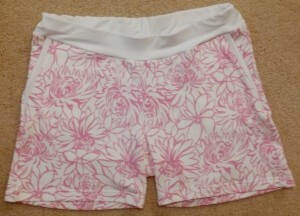 It looks as if another pair of Summer Lovin’ Shorts will be up on the cutting table soon as my mom recently saw them and asked if I could make her a pair. I haven’t decided on the fabric, however, I’m leaning toward a print similar to the Anima shorts and pants that I made earlier in the year (believe it or not, I have a third colorway to choose from)! This also means a trip to the fabric store for notions (more elastic) and another round of printing\cutting, but this one sews so fast, I don’t even mind! In other news, my mystery\KnitFix bundle from Girl Charlee arrives today, so I’ll be stalking the UPS man this afternoon waiting for it’s arrival. I’ll do the reveal in Friday’s post and hope to have some plans formulated in my head for using some of my new materials! Agh, waiting is so hard! This entry was posted in Uncategorized on June 17, 2015 by stacy.